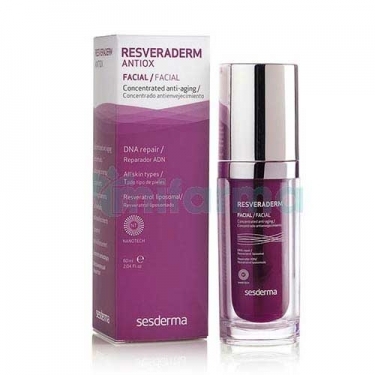 DESCRIPTION: Resveraderm Antiox Facial Concentrated Anti-Aging from Sesderma is an anti-aging facial care for furs of all kinds. Formulated with Resveratrol and Co-enzyme Q10 and enriched with Grape Polyphenols and Vitamins C and E, it acts inside cells to protect and repair skin aging while rubbing wrinkles and refining the contour of the face. The skin is rejuvenated from the inside. Apply morning and/or evening on clean skin.